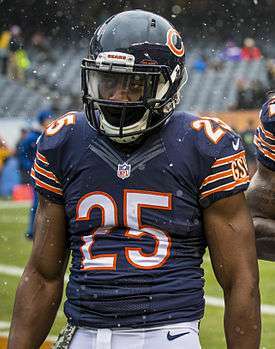 Ka'Deem Carey (born October 30, 1992) is an American football running back for the Chicago Bears of the National Football League (NFL). He was drafted by the Bears in the fourth round of the 2014 NFL Draft. He played college football at Arizona, where he was recognized as an All-American. Carey attended Canyon del Oro High School in Oro Valley, Arizona. As a senior he rushed for 1,754 yards with 26 touchdowns. As a junior he rushed for 2,738 yards on 224 carries with 45 touchdowns. Carey attended the University of Arizona, where he played for the Arizona Wildcats football team from 2011-2013. As a true freshman in 2011, Carey rushed for 425 yards on 91 carries with six touchdowns. In 13 games of his sophomore season in 2012, he rushed for 1,929 yards on 303 carries with 23 touchdowns, which broke the Arizona single-season record for both rushing yards and rushing touchdowns. On November 10, 2012 Carey set the Pac-12 record for rushing yards in a game with 366. On December 11, 2012 Carey was named a 2012 consensus All-American at the running back position. In January 2013, he pleaded not guilty to misdemeanor assault and disorderly conduct charges stemming from an alleged domestic violence. Charges were dropped in June. Carey served a one-game suspension to start the 2013 football season. During the season he set a school record for rushing yards and rushing touchdowns. He finished the season with 1,885 yards on 349 carries and 19 touchdowns and was a consensus All-American for the second straight season. On January 13, 2014, Carey announced that he would forgo his senior season and enter the 2014 NFL Draft. Carey was drafted by the Chicago Bears with the 117th overall pick (17th pick of the 4th round). Carey signed a four-year contract on May 13, 2014. In week thirteen of 2015, Carey scored his first career rushing touchdown against the San Francisco 49ers on a four-yard run. On December 27, 2015, Carey recorded his first career receiving touchdown in a 26-21 win against the Tampa Bay Buccaneers. ↑ "Arizona RB Ka'Deem Carey to enter 2014 NFL Draft". NFL.com. 2014-01-13. Retrieved 2014-01-20. ↑ Alper, Josh (May 13, 2014). "Bears sign Ka'Deem Carey". NBCSports.com. Retrieved 2014-08-17. ↑ Mayer, Larry (December 6, 2015). "Read and React: Bears-49ers". Chicago Bears. Retrieved December 6, 2015. ↑ "Bears vs. Buccaneers - Box Score - December 27, 2015 - ESPN". ESPN.com. Retrieved 2016-01-09.